Millennials: The group of young Americans born between 1981 and 1996. The oldest are turning 37 and the youngest are turning 22. Millennials are the largest generation in Western history and the Republican Party has completely failed to communicate with them in a meaningful way — or really at all. This is a huge problem. Republicans stand behind issues that should be extremely appealing to any generation: a growing economy (more jobs); lower taxes (more take-home pay); preservation of constitutional tenets (free speech, the right to assemble, the right to protect yourself, the 2nd amendment, freedom of press and the pillars of what makes America…well, America!). These things should draw Millennials to the Republican Party but somehow, it is not. We can’t seem to tell them why these things matter in a voice that speaks to them. We have to change the messaging so it changes the conversation. We, Republicans, are failing on all fronts because sadly, we have not changed our messaging in over 30 years. Think about it — when was the last time you saw a Republican candidate speaking on a college campus? The absence of the Republican Party and our lack of dialogue on college campuses reinforce a false perception that Millennials are not welcome within the Republican Party. With this unintended neglect, an entire generation of tremendous brand potential has been overlooked. Democrats on the other hand, have gained ground with Millennials. When Barack Obama promised hope and change in 2008, Millennials had his back — big time! We saw the same trend with Bernie Sanders. His message spoke to young people across the country, garnering more support from them than Donald Trump and Hillary Clinton. Now, the naysayers say, “Of course, if you give stuff away for free, it will get people’s attention.” But in reality, this is bigger than that. Here lies the first hurdle and the fundamental problem: What do Millennials believe they are responsible for fixing? Well, like every generation before them, they want good jobs, they want greater opportunities, and they want the cycle of poverty to end. They want dignity, integrity, and earned respect. Yet, they just haven’t figured out that all of the above does not come from government intervention. No, instead it is stifled by government intervention. How have the Democrats bamboozled these young people for so long? Here’s how: The Democrats have mastered the art of attack and they’re damn good at it. Democrats have always put Republicans on the defense rather than the offense, regardless of who’s in the White House. Meanwhile, Republicans have accepted being “branded” as white, rich, thoughtless, old men who only care about themselves, money, and will do anything to make themselves taller by standing on someone else’s head. So, how does all this fit into the Republican narrative? Republicans can raise money, as we are witnessing now in one of the largest fundraising successes in the RNC history. Yet, this is eclipsed by the attacks from the Democrats being perceived as more “giving” and the Republicans as the party of “taking”. Let’s be honest here, the Democrats are seen as the party of enabling and the Republicans are always looking to restrict. Democrats care, Republicans are selfish. Democrats care about people and the Republicans only care about business and themselves. How’s that for branding? It is TOTAL nonsense — yet, it is the narrative and it is sticking. Shame on us for allowing this to succeed for so long. Essentially, Democrats have lucked out because Millennials seem to lean more toward liberal ideals (what the Liberals have the nerve to call “progressive”). What’s progressive about enabling generation after generation to be on welfare and perpetuating the plight of the poor? What’s “progressive” about not securing our borders? But once again, Brand or be Branded! Democrats are perceived as “liberal and progressive” and the mean, stodgy Republicans are “conservative and disciplined.” Which one would you choose if you were 18 years-old and getting ready to vote for the first time? The value system of Millennials is drastically different than those who came before them. To them, stability doesn’t matter as much, nor does the concept “living to work” rather than simply “working to live.” They move from job to job because they are always seeking something new, fresh, and exciting. They are not driven by loyalty, especially to their jobs or employers because “work” is just one small aspect of what is important to them as individuals and contributors. They care more about spending their money on experiences, travel, and seeking work-life balance. They care more about getting a picture-perfect shot of avocado toast for Instagram than they do moving into a house with all of the responsibility. Taxes aren’t on the list of frustrations for a group that has adopted Bernie Sander’s vision of America. They believe they should pay their fair share and not more than that. Meaning, they are operating on a pay-to-use mindset. If they need it, they’ll buy it; if they don’t, they don’t want to share in the expense. Millennials are the want-it-now generation. After all, they have grown up never knowing a life without technology — instant responses, instant gratification of knowledge. Many have been raised on Google, Facebook, Amazon, and a vast online catalog of items that can be shipped to them within a moment with a click of a button. They expect things to be solved fast and furiously and don’t think about the real advantages this country offers, as they have never experienced anything else. The authenticity and joy that can be theirs as Americans is lost, as they don’t know or perceive the Constitution, Liberty or Freedom from the rest of the world, as being a unique differentiator. The have never lived not “free”. It is also important to acknowledge that Millennials are passionate and empathetic. They are entrepreneurs; they are the most educated generation of our time and if you need flawless, technological geniuses — they’re your people! There is so much to harness and concentrate on the betterment of our country by engaging the Millennial Voice. 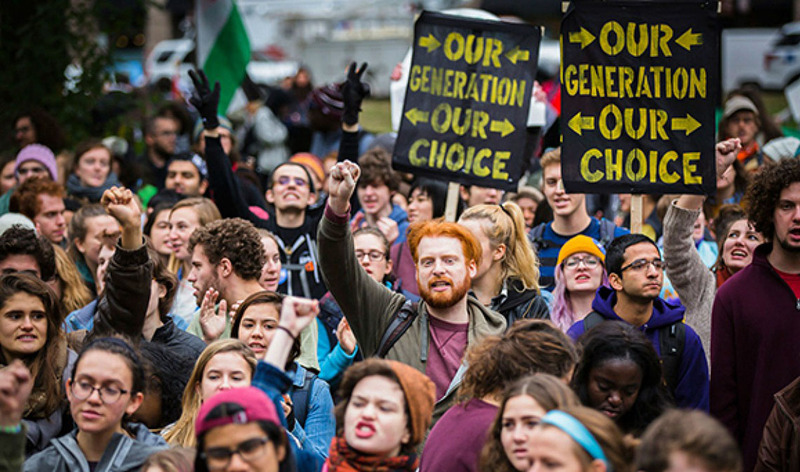 It would be a huge boom for the Republicans if they directed their attention to this special group of young people — who, by the way, comprise the upcoming majority of the voting bloc in the United States. They need the Republican Party and we are not advancing those ideals. If the Republican Party doesn’t find a way to brand itself to appeal to America’s youth, then it has no chance of survival. That sounds drastic but it’s all too true. It comes down to this: Want to put the Republican Party out of business? Keep ignoring the group of people who have the ability to destroy them in a single election cycle. If you want to shape a young generation of passionate, driven, and smart people to meaningful action and change, we better start now. It starts with changing the conversation, adopting our messaging to better align with their expectations. We need to retell our story in ways where we can reach our Millennials, who have lived the last 20 years with relatively few interruptions to their lives. The way to rebrand the Republican Party is to begin with the truth. We need to change the conversation and begin to harness as well as secure the next generation of Millennial leadership so that our story is told fairly and correctly. With all that benefits them, if we begin the process of rebranding the Republican Party for what it really can mean to Millennials, and how it can elevate their lifestyle, we will change the conversation.